This breakfast combo pairs Goldfish® Grahams Baked with Whole Grain French Toast with peaches and yogurt to kick start the day! 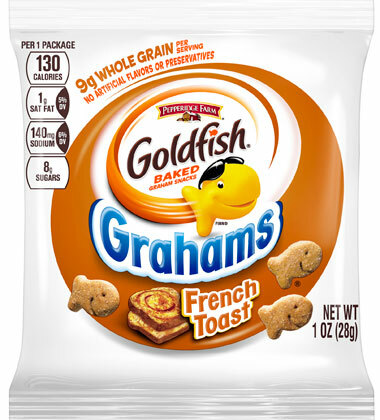 Goldfish® Grahams Baked with Whole Grain French Toast gives the yogurt parfait the perfect crunch and sweetness. This combo is reimbursable and can be packaged into a convenient grab-and-go format. low fat (1%) milk	 8 fl oz. orange juice	 4 fl oz. 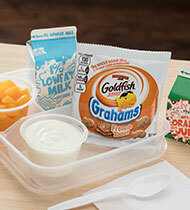 Pair Goldfish® Grahams Baked with Whole Grain Honey Bun (1 oz grain equivalence) with 1/2 cup of peaches, 1/2 cup of low-fat yogurt, 4 oz 100% orange juice and 8 oz of low-fat milk to form a reimbursable breakfast. Packaging it all the elements into a disposable container to make it a grab-and-go option.